Balance does not come easy to me. Except on the yoga mat…I’m pretty good at not falling over there. But as for balancing my day-to-day chores and activities? Well, that’s where I’m lacking. I will bake for 3 days straight and the laundry will pile up. I will blog for 3 days straight and the stack of dirty dishes in the sink multiplies. I will clean my house from top to bottom in a 2-3 day sprint, only to have my clients photos sit unedited and then I’m stuck to my computer chair for an entire weekend to try to finish them. Why can’t I just do a little bit of everything all the time so chores don’t grow into overwhelming monster tasks? This is a question of balance. A question I plan on addressing this year. Starting now. I used to keep my computer in the kitchen on my counter so I could blog whenever I had a minute. Problem was, that minute often turned into 85 minutes. Dinner wasn’t started until it was really late, my kids didn’t get their school reading done, I never got any reading done, which used to be my favourite activity! And laundry? Ha. I was pushing out 3 to 4 blog posts every week. My days were full of children. My blog was full of children. My room was full of children. My evenings were full of children. Are you sensing a theme here? There was no balance. 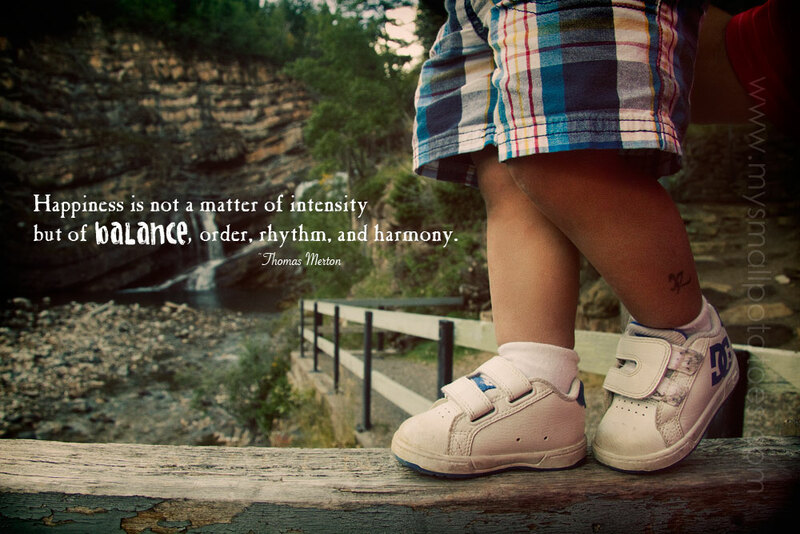 And without balance, there is no harmony. Anyone who sings will know that to make a beautiful harmony, no singer can out sing the other…it just doesn’t work. And that’s how my world was going. One singer was belting out the lyrics as if her life depended on it, while the rest had hardly any voice at all. Including the children. So I’ve started to take back the balance I have lost. I took all the baby cots and blankies out of my room. I made a pretty little office area in there instead. The computer is out of my kitchen and on my desk next to my travel journals and photographs of my children. It is a happy little working corner” of my room. We mamas know that our kids are important. We would give our lives to make them happy. I love all the children in my world. By taking back a piece of myself, I am not saying that these little people are no longer as important to me. It means the exact opposite. If this mama is over-tired, stressed out, rushing about overwhelmed with the things falling apart around her, she can’t give proper care and attention to these wee little souls around her. Mama needs a break for her soul, too. And so I’m reading more and sitting at my computer less. I’m spending time on my yoga mat. I’m listening to cello music more often…my very favourite. And I can already hear the harmony coming back to my home. What does this mean for my blogging schedule? Well, it means there will be fewer posts, but the quality will be much better. When a person spends careful quiet time on something, instead of madly rushing to get it done, the result is always noticeably better. When a person takes time to listen, she can give more of what people actually want. Thanks for stopping by, and welcome to the new and improved Small Potatoes. p.s. So now that I’m really, really listening…please take a minute and drop me a note…I’d like to hear what kinds of things you’d like to see on the blog this year. Really. It takes many voices to make a choir. Let’s do it! I suffer from the same. With all four of my design teams and blogging, my house is always in a constant uproar not to mention my hubby away for a week and them home for a week. I need to find balance too. I think this year I have to go out for walks more and try to unplug when I can. Your blog is amazing!!! Thanks, Lee-Anne! I had my computer unplugged for the entire Christmas break. I put it upstairs in the corner and forgot all about it. I loved it. Being without it for 2 weeks made me realize that the world would not come to an end if I took a break! Lol! I can relate to the constant struggle of finding balance. I am constantly reviewing my actions to see what I am doing and what I would like to be doing. What I love most in your blog is the awesome creative stuff you do with kids. You inspire me to look at my interactions with my kids and see if I could be providing more opportunities to be creative. I love the way you organize all your supplies. I love the way you use them. Thanks for sharing, they have changed the way I play with my kids. I love this post! It’s like I hear and feel what you write like my own words and needs right now! I will be striving for this balance this year too!! Good on you! Oh! And I love cello music too! (Were you in my head writing this? ) ha. Hehehehe! Soul sisters xo Have a great weekend, Char. And give that girl of yours a big snug. 🙂 Thanks for reading! Thank you Arlee…you have taken for me the guilt of having some mama time away. I am exactly like you I have daycare, children, husband and chores and sometimes people don’t realize how out of balance a woman’s life can become so quickly. And thank you for taking a voice for all of us mamas who work hard and sometimes needs a reading like this to help us realize we have to take time for ourselves too. Blessings to you! I totally agree, it’s not a question of force, and harmony needs also slow time, sometimes. I love to see you smiling behind your posts, they will be more precious! I feel the same way. I sometimes wonder what’s the point of cleaning when its just going to get dirty again in a day. Then, I snap out of it and remember that a clean house makes me happy. So at the very least I should do it because it puts me in a good mood. I just found your blog and its so refreshing…this post is like you are reading my mind! I struggle every day to find balance! With trying to train for a marathon, doing child care out of my home, working on getting my Tastefully Simple business going, spending quality time with my 2 girls and husband and everyday chores, well I find it hard to find time to Stop and smell the roses. I’m working on it, that’s why I’m writing a response to this post outside as the children are playing in the yard! Thank you and I look forward to reading more of your blog!